These gyoza are bite-sized and easy to eat, and are seasoned with ginger. Simply pan-fry and steam-bake to enjoy. Can be eaten as a side dish or used in soups or hot pots. Product totals 270g (30 pieces). This item contains more meat than our Petit gyoza. While these hot ginger gyoza may also be “petit” in size, they pack a flavorful punch. The invigorating flavor of the ginger will leave you wanting more! Ginger gyoza are especially popular with our female customers. 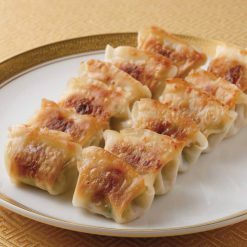 Eating ginger gyoza can serve to warm the whole body, and we recommend using them as an ingredient in warm dishes such as soup or hot pot. We chose to name this item “hot” both in reference to the Japanese phrase “hotto suru” (feel relieved) and to the English word “hot,” since these gyoza are warming to eat. Distribute 1 tablespoon of oil in a heated frying pan, then add the gyoza (still frozen). If using a fluorine (Teflon) pan, no oil is necessary. Add enough water (about 100ml) to submerge the bottoms of the gyoza, cover with a lid and steam-bake on medium heat for about 5 minutes. Just before the water has all evaporated, lower the heat a little and add 1 teaspoon of oil. Distribute the oil evenly throughout the pan. Fry for about 2 minutes. When the bottoms of the gyoza look pan-fried, they are done.Hot oil may jump from the pan. Please use caution to avoid burns.Please adjust quantities of oil and water and lengths of cooking time according to the number of gyoza being cooked and your frying pan’s size and efficiency. 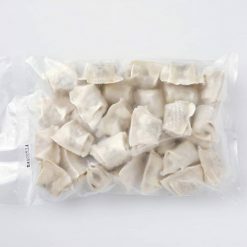 This product contains vegetables (cabbage, ginger, garlic chives, garlic), meat (pork, chicken), pig fat, filler (granulated soy protein, potato starch), sesame oil, sugar, table salt, soy sauce, yeast extract, black pepper, wrappers (wheat flour, table salt, malt sugar).. This product is not suitable for anyone with allergies to wheat, soy, chicken, pork, sesame or contamination. Origin of ingredients: cabbage/pig fat/pork (domestic), ginger (China). Prepared and packaged in Japan.